Elections 2018 are going to take place exactly after one week. Election Commission of Pakistan is trying hard to conduct crystal clear elections. Therefore, ECP has launched a new election application named click ECP. 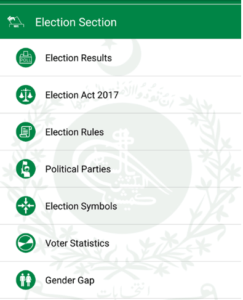 Through this app, the user can get each and every information about the elections such as polling station details, member details, add or modify the vote and media section. The app contains all the information regarding voters, new updates, election party details, media section and much more. If you want to check your vote and polling station, then you can follow this procedure. First of all, click on check vote by click at the voter section. Now, you have to enter your CNIC there and then submit it. Shortly, it will send all the information such as polling station, block code etc. However, it will charge 2 rupees for this SMS. If you do not have a vote or not added in voter list, then you can also add or modify your vote. How to Cast a Vote? You can get the complete detail of how to cast a vote such as a ballot, candidate, citizen, democracy and CNIC detail. Through this section, you will get all the latest updates and any change in the election procedure. This section contains all the contact data of ECP in case of any query and complain. The click ECP app is available on google play store and s free of cost. First of all, search the application on play store and then install it. This app will facilitate you even after elections and will update you about each and everything. Currently, this application has more than 1.2K likes and 3.9 out of 5 rating.